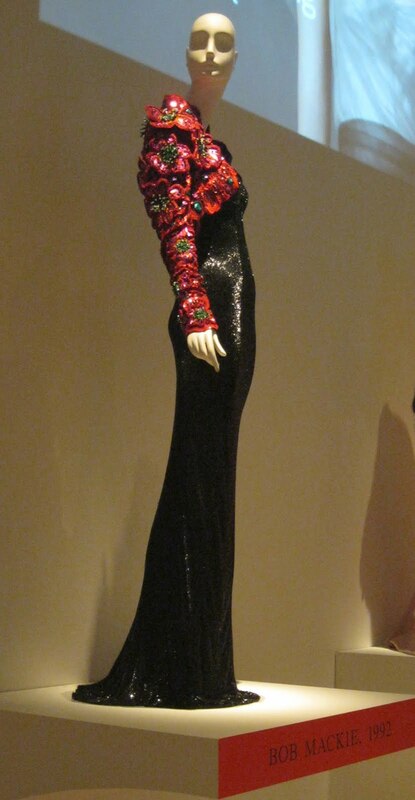 I’m having a week where I just need some Bob Mackie in my life. Now we will take a deep breath and instead of worrying about things over which we have no control, we will look at a glamorous 1992 Bob Mackie creation now on view at The Museum at FIT as part of the exhibit IMPACT: 50 Years of the CFDA. I liked plenty of looks on the ladies at this year’s Academy Awards but I do wish there were a few risk-takers, like Cher back in the day in all her Bob Mackie-wearing glory. I love me a sequin so I adore everything about this evening gown and flower bolero. I wish I could wear this while pacing around my living room, waiting to hear about kindergarten and hoping my credit card problems will be sorted out soon. If Bob Mackie can’t cheer me up, no one can. You’ll have to be a tall drink of water to pull this number off, look how slender and willowy the gown is! Good luck with the kindergarten list. I have a co-worker who had to drive her kids 30 minutes to school in another town, because their (public) neighborhood school was too crowded! They were on a waiting list, too. That gown looks like something that Carol Burnett would wear. I remember she would wear the Mackie gowns on her show. I also miss the more "interesting" outfits at the award shows. Thank you for bringing so much beauty to my life. Sorry about your card. When I was little I used to dream of collecting Bob Mackie Barbie dolls. I can't imagine wait lists for kindergarten and I hope by now you know. So sorry to hear about your card((( That person spoiled her karma for a very long time. My dear Jill, my knee is fine. Bandages came off and I am slowly biking, but there will be no New York until Autumn. I want us to go when I can walk miles. Thank you for caring, and for being there, my sweet friend. Sorry to hear about your card. I know how that feels. It will come back to them. I really need to make a New York trip, uggh! Bob Mackie, priceless! Jill so sorry to hear that - surely that card company won't charge you for the purchases?? That's the whole point of a credit card - you should be protected from that kind of thing - anyway this is an amazing bolero! Best of luck with kindergarten - Londoners face similiar problems getting kids into kindergartens and schools.